BUENOS AIRES, Argentina, June 15, 2018 -- The USA collected 13 individual event medals (five gold, six silver and two bronze) on the final day of competition at the 2018 Junior Pan American Championships at the City of Buenos Aires (Argentina) Club. The gold medalists are: Jordan Bowers of Lincoln, Neb./Solid Rock Gymnastics; JR Chou of Cypress, Texas/Cypress Academy of Gymnastics; and Tori Tatum of Chanhassen, Minn./Twin City Twisters. 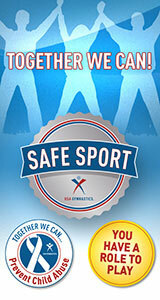 For the three-day competition, the USA’s total medal count was 17 (seven gold, eight silver and three bronze). The U.S. women went one-two in women’s vault, uneven bars and floor exercise. Tatum earned a 14.575 for her double-twisting Yurchenko and a 14.200 for her Yurchenko one-and-a-half, giving her a 14.388 average. Wong scored a 14.825 for her double-twisting Yurchenko and a 13.400 for her Yurchenko layout, tallying a 14.113 average. Canada’s Imogen Paterson was third (13.713). On the uneven bars, Bowers’ 13.850 landed her in front of Leanne Wong of Overland Park, Kansas/GAGE, who earned a 13.450. Canada’s Zoe Allaire-Bourgie rounded out the top three at 13.225. For the floor exercise, Bowers garnered a 13.225 for the title. Tatum received a 12.925 and the silver. Canada’s Mia St. Pierre claimed the bronze (12.775). Wong and Bowers were second (13.500) and third (13.250), respectively, on the balance beam. Allaire-Bourgie won at 13.800. The women’s medals were three gold, four silver and one bronze. Chou clinched the floor exercise gold medal with his 13.450. Brazil’s Diogo Brajao Soares finished on Chou’s heels at 13.350 for second, just ahead of Canada’s Felix Dolci at 13.250. Brandon Briones of Gilbert, Ariz./Aspire Kids Sports Center, scored a 13.000 for sixth. Chou also took top honors on the pommel horse, posting a 13.475. Mexico’s Jorge Perez Guzman and Brazil’s Murilo de Souza Pontedura were second (12.800) and third (12.700), respectively. Briones finished sixth (11.725). On the still rings, Briones’ 13.075 gave him the silver. Dolci and teammate Felix Blaquiere were the gold (13.450) and bronze (12.875) medalists, respectively. Isaiah Drake of Los Angeles/Gymnastics Olympica USA, posted a 12.475 for seventh. For the vault bronze, Briones received a 14.175 and a 12.375 for his vaults and an average of 13.275. The gold went to Brajao Soares (13.775) and Ecuador’s Joan Pilay Saigua took the silver (13.625). Chou’s two vault scores were 13.700 and 11.900 for a 12.800 average for fifth. Briones wrapped up his day with the horizontal bar silver (13.050). Brajao Soares won the event (13.300) and Dolici was third (12.950). Taylor Burkhart of Morrison, Colo./5280 Gymnastics, just missed the medals podium, finishing fourth at 12.850. The parallel bars’ medalists were: gold, Blaquiere, 13.225; silver, de Souza Pontedura, 13.200; and bronze, Brajao Soares, 13.000. Briones (12.750) and Burkhart (12.575) placed sixth and seventh. The U.S. men’s medals were two gold, two silver and one bronze. 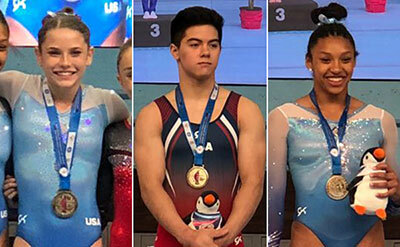 Earlier in the competition, both the U.S. women and men won their respective team titles, and Bowers and Briones won their respective all-around titles. Wong also claimed the all-around bronze. JaFree Scott of Independence, Mo./GAGE, also competed on the women’s team. Based on the all-around results, the USA qualified for a berth to the 2018 Youth Olympic Games, which will be held in Buenos Aires in October, for both men’s and women’s gymnastics, and has previously qualified for rhythmic gymnastics. The qualification process for trampoline is next week.